AUSTIN, Texas — Cmdr. Bruce Melnick, a 1972 graduate of the Coast Guard Academy, along with Arizona State University standout linebacker Pat Tillman, who later starred for the National Football League’s Arizona Cardinals before serving his country in the military, University of Florida and Olympic gymnast Elfi Schlegel, Pepperdine University and Olympic men’s water polo standout Dr. Terry Schroeder, Lycoming College football star and current United States Circuit Court Judge Thomas Vanaskie are this year’s 2013 inductees into the Capital One Academic All-America® Hall of Fame, as selected by CoSIDA. The five new inductees join 122 members of the Capital One Academic All-America® Hall of Fame, which was created in 1988. They will be inducted into the Academic All-America® Hall of Fame at CoSIDA’s annual convention in Orlando, Fla. on Wednesday, June 12 at the organization’s Fourth Annual Capital One Hall of Fame Ceremony, which for the first time will be part of the annual National Association of Collegiate Directors of Athletics Convention. 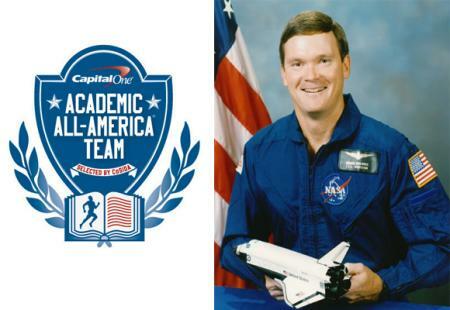 This marks the third year that Capital One is the title sponsor of both the Academic All-America® program and the Academic All-America® Hall of Fame. Melnick, a decorated NASA astronaut, becomes the first athlete from the Coast Guard Academy to earn this prestigous honor. He achieved success and great distinction in service to his country and the United States Coast Guard Academy. A two-year letter winner on the gridiron for the Bears, Melnick earned Academic All-America®honors and helped lead Coast Guard to an 8-2 mark during his senior campaign of 1971, which equaled the school record for victories in a season. After graduating from the Academy with a degree in Engineering in 1972, Melnick embarked on a 20-year career in the Coast Guard, where his assignments included serving as operations office and chief test pilot in the Aircraft Program Office. He received numerous awards during that tenure, including two Department of Defense Distinguished Service Medals, two Distinguished Flying Crosses and the Secretary of Transportation Heroism Award. Selected by NASA in June 1987, Melnick qualified for space flight and became an astronaut in August 1988. He performed subsequent technical assignments before flying as a mission specialist on the Shuttle Discovery from October 6-10, 1990 as well as the flight engineer on Shuttle Endeavour’s maiden voyage from May 7-16, 1992. He logged more than 300 hours in space, orbiting the Earth 207 times. After retiring from the Coast Guard and leaving NASA in 1992, Melnick joined Lockheed Space Operations Company. In 1996, he joined McDonnell Douglas as Vice President for Payload Ground Operations Contract with NASA, and in 1997, when McDonnell Douglas merged with The Boeing Company, Melnick became Vice President of Boeing Florida Operations, serving in that role until his retirement in 2007. Melnick earned his master’s degree in aeronautical systems in 1975 from the University of West Florida, which bestowed upon him an honorary doctorate of science degree in April 2001.